Just creation of Lit Sphere materials and library with them in 3dsmax we’ll do now. In this article we won’t consider creation of pictures with spheres, but we’ll take the ready-made. Our task is to create a material whose properties will be equally visible as when working with a model in the viewport, and in the case where we need to render our model. For visualization of materials in viewport in 3dsmax and for rendering are responsible different shaders, material created just for rendering is likely to be incorrectly displayed in the viewport, and vice versa. We’ll begin with the material for the viewport. 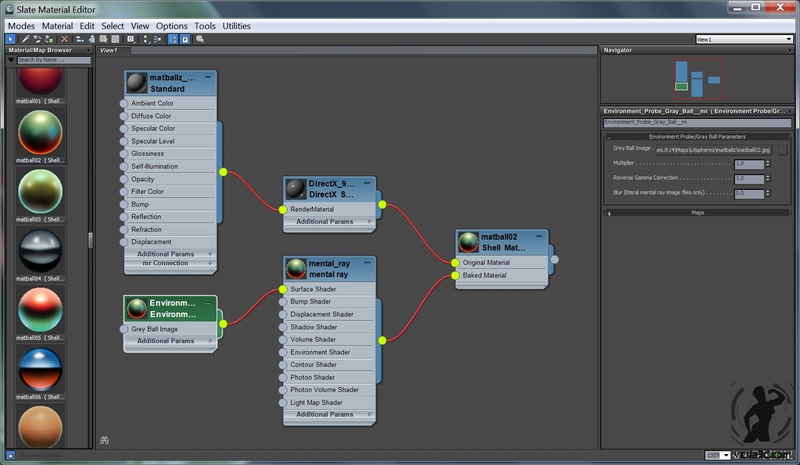 In 3dsmax There is no ready-made shader, which would work with such images. That’s why we’ll make use of Matballz shader. written by Charles Hollemeersch. – For work in Direct3d mode (directx 9) you should use the original Matballz.fx shader. – For work in Nitrous mode (Directx 11) you should use modified by me Matballz11.fx which support Directx 11. Assigning it to to your object you can see its work in viewport, but if you render the scene, then the properties of your material will be lost because the DirectX shader does not work with a renderer. As renderer we will use Mental Ray. 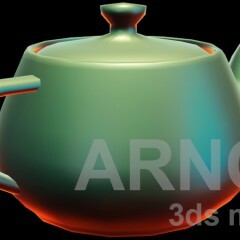 Mental Ray comes with Environment Probe/Gray Ball shader, its properties are similar to Matballz.fx. This material will be visible on the render, made by Mental Ray but in the viewport material properties will be lost. Materials-> Standard->Shell material->Original Material->DirectX Shader (created earlier); Baked Material-> mental ray (created earlier). So our final material will look the same in the viewport and in render that you can see in the screenshots. Create hundreds of nearly identical materials manually is tedious task, so I wrote a maxscript (litsphere_lib), which will help us to automate this task. 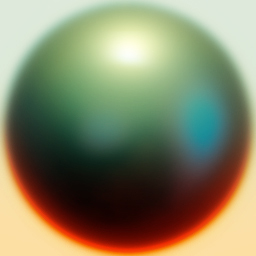 You will need to specify the .FX shader that you want to use, and the folder in which your images with sphere. The script automatically tried all images in a folder and all its sub-folders, and then create the materials on the same principle, which we have reviewed above, then save them in a new library. Using the library you created, you can quickly change the Lit sphere materials on your objects that allow you to identify errors in the object topology. Changsoo Eun recently posted alternative approach to achieve LitSphere material in viewport. If you interested so please check his script SuperClayMode. Hi mike, i’ve been looking for this for years 🙂 tks a lot! I’m encountering a shading problem today, because when i create a 3d geometry from a 2d shape and apply the matballz11.fx it looks totally flat. Can you tell me what version of 3ds max do you use? And will be easy find whats wrong if you share simple max scene where object looks flat. Add a UVW map on top of your modifiers stack. And your object won’t look flat anymore. Anyway, I’m using 3ds max 2015 sp3 with nitrous , when you create 3d meshes from 2d shapes and apply the matballz11.fx it looks flat as you can see ( image link ). If i use Shader fx to simulate the same thing it works well. Claudio, yeah, objects created from shapes looks flat because doesn’t have any UVW mapping. Check “Generate Mapping Coords.” in modifier that you use to create object and voila. Can you share ShaderFX shader that what you use? Matballz good solution for older version of 3ds max. I’m looking forward to replace it on 3ds max 2016+. TKS Bro It works perfect, I totally forgotten about UV coordinates. Anyway if you create any mesh from a 2d shape you just need to add a uvw map modifer with any mapping coordinates and work in realistic mode to avoid to see ” void ” meshes :). It’s a pleasure to share my library of shaderfx. I’m an hard surface modeler and you know how important is to receive realtime reflection feedback directly from the viewport. Below there’s a short list of the most used nodes. And I usually use Knald Lys software to create Glossy reflection maps. Probably It can be improved but i didn’t have time to handle it. I hope it can helps :). Thank you Claudio! I’m sure that help me with ShaderFX matcap material. Not much on google about what seems to be a great improvement of Max’s viewport. Most of my searches take me back here. So… Question : where do I cop the .fx and its “matballz” folder. It’s probably obvious enough not to write any “install” section. But I just don’t get how to do that. Thanks in advance for your help on the subject. Cheers. You can load .fx file and textures from “matballz” folder into DirectX shader from anywhere. No “installation” required. Hi 🙂 I’ve been enjoying very much this amazing fx in Max2017. But as this last release of 3DSMax is still unstable, I went back to 3DSMax 2013. Better compatibility for many plugins. BUT now, I have only access to DirectX 9. So I came back here to download the original Matballz.fx shader but the download links I found here give only access to the DX11 version. Could you please advice ? Thanks 🙂 I really need that. It makes modeling in 3DSMax so much more comfortable ! Link to original Directx 9 shader fixed. Now you can download it. Damn ! That was fast 🙂 I thought I’d have to cry for a week or so but nope : 25 minutes only 😉 You’re my hero ! I whish you a good day RGhost.